Our amazing Vintage childrens roundabout or Dobbie Set, brings all the fun and colour of the traditional fairground to any event. Built by the famous Halstead amusement company back in 1906 the ride was commissioned for the Pullen Family who traveled the ride for over 100 years. It features Cockerels and Horses carved by Spooners of Burton On Trent, all suspended on traditional twisted brass covered rods. The ride also has two amazing and unusual Peacock Chariots that each seat up to 6 children. 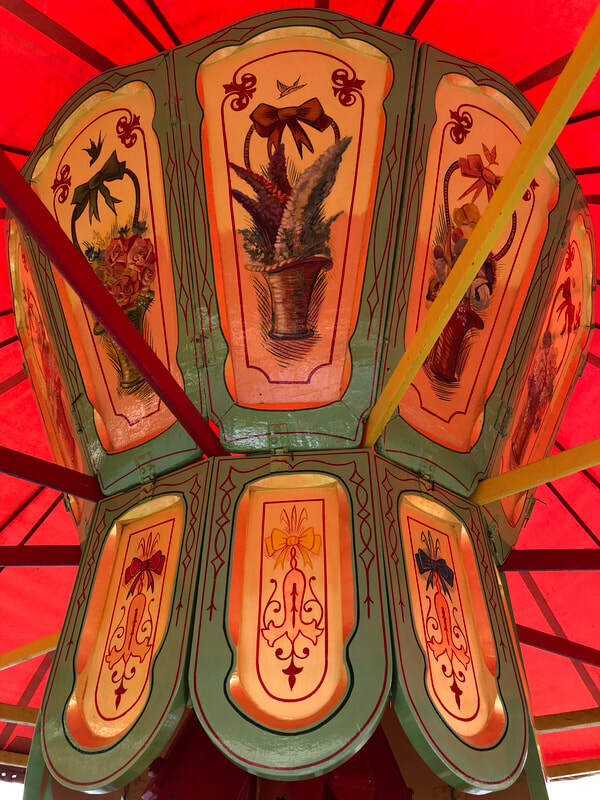 This Edwardian Carousel is 16 feet across and powered entirely by hand using the large cast fly wheel. The panelling and rounding boards have been painted by eminent fairground artist Katie Morgan. Our ride is a piece of living history. It has an annual safety check to comply with the ADIPS Register of fairground equipment and is fully maintained and insured to give you piece of mind. You can hire the ride for your festival or event and it will be built up and operated by our own trained staff.